The "Salon" writer, Paul Rosenberg is a shrill critic of everything and everyone on the conservative side of American politics so his rant excerpted below is not unexpected. The poor fellow is just full of hate. He never runs out of it. So his denunciation of climate critics as worse than Hitler seems deranged but was to be expected. But he is not insane. Given his assumptions, climate critics are indeed a bad lot. Rosenberg has drunken every drop of the Warmist Kool-Aid so really seems to believe that a "Climate holocaust" will soon happen. So his whole rant is an excellent example of a basic precept in logic: "If your premises are wrong, your conclusions from them will also be wrong". Rosenberg shows not the slightest awareness of any of the scientific facts about CO2 and climate so has violated that basic rule of logic. Our guidance is to use climate change doubters or those who reject mainstream climate science and to avoid the use of skeptics or deniers. This is, quite simply, wrong. Wrong, wrong, wrong, wrong, wrong. This wasn’t just a one-time error in judgement. It’s an ongoing journalistic sin we’re talking about, a sin of commission, a continuing misrepresentation of reality, something that no journalistic entity worth its salt ought to be a party to. Scientists who consider themselves real skeptics – who debunk mysticism, ESP and other pseudoscience, such as those who are part of the Center [sic] for Skeptical Inquiry – complain that non-scientists who reject mainstream climate science have usurped the phrase skeptic. They say they aren’t skeptics because “proper skepticism promotes scientific inquiry, critical investigation and the use of reason in examining controversial and extraordinary claims.” That group prefers the phrase “climate change deniers” for those who reject accepted global warming data and theory. But those who reject climate science say the phrase denier has the pejorative ring of Holocaust denier so The Associated Press prefers climate change doubter or someone who rejects mainstream science. This is a classic example of false balance on AP’s part, with multiple problems on both sides of the scale and one big thing wrong at the middle: “doubt” is not mid-way between “skepticism” and “denial” . It far closer to the former than to the latter, which is why the deniers were so pleased with it. Joe Romm cited three problems with AP’s reason: First, that AP had an easy alternative, pointed out by Justin Gillis in the NY Times in February: “others have started using the slightly softer word ‘denialist’ to make the same point without stirring complaints about evoking the Holocaust.” Second, that the most prominent deniers, like James Inhofe “knowingly use phony arguments to stop the world from acting in time…. Since when should anyone care about the phony concerns of such self-destructive anti-scientific people?” Third, Romm noted that many deniers actually like the term. If they don’t have a problem with it, why should we? All that is true, but there’s a further point worth making: climate change denial is actually much worse than Holocaust denial. Holocaust denial deals with the deaths of millions in the past, which it did nothing to cause, however morally odious it surely is. Global warming denial deals with the deaths of millions in the future, which it helps to cause, by crippling efforts to prevent them. And that’s something much worse, as is reflected in law: It’s not a crime to lie about murders in the past, except to hinder a police investigation, or prosecution; but it is a crime to tell enabling lies about future murders—it’s called conspiracy to commit murder. AP says we shouldn’t use the term “denier”, because it has a “pejorative ring.” Which begs the question: isn’t a pejorative ring precisely what’s called for? Isn’t it both morally necessary and empirically accurate? The problem isn’t that “denier” has a “pejorative ring,” it’s that it’s not nearly pejorative enough. “Climate holocaust co-conspirator” would be more apt. You either align yourself more or less with the climate deniers—consciously or unconsciously—or you align yourself against them. There is no “neutral” ground outside of or above the debate, however much one might wish for it. Last week, the United Nations Intergovernmental Panel on Climate Change (IPCC) held a news conference in Dubrovnik, Croatia, to introduce South Korean bureaucrat Hoesung Lee as its new chairman. Mr. Lee’s remarks to the press demonstrated that he is sadly out of touch with the actual status of today’s climate science. This is not surprising. Although Mr. Lee said, “The hard science of climate change will remain the foundation of the IPCC’s work,” he has practically no hard science training or experience. Instead, he has a doctorate in economics and a career as an economist, IPCC insider and environment professor. Yet, when Jill Peters, weather broadcaster for Belgium Television, referred to Mr. Lee as a “climate scientist” in her question at the news conference, he did not correct the mistake. Mr. Lee demonstrated this when he told reporters, “We know with 95 percent confidence that human activity is causing climate change.” While it is true that by replacing forests with farms, buildings and roads, we cause regional climate change, Mr. Lee should know that this is not the primary issue at hand. The most important question is this: Are our carbon-dioxide (CO2) emissions likely to cause climate change dangerous enough to be worth changing the way we generate and use energy? The reports of the Nongovernmental International Panel on Climate Change (NIPCC) demonstrate that many climate scientists dispute the idea that carbon-dioxide emissions need to be reduced at all. Mr. Lee is clearly not qualified to imply that NIPCC scientists are wrong. In addition, the lack of global warming over the past 18 years, a period during which carbon-dioxide concentration in the atmosphere has risen 10 percent, shows there is something seriously wrong with the human-caused warming theory the new IPCC chairman holds dear. Let’s hope Hoesung Lee leads the IPCC to finally open the door to a balanced consideration of the science driving the climate scare. There is too much at stake to do otherwise. Alford cited a study that his group had commissioned. It found that by 2035, the CPP would have boosted energy costs for blacks by 16 percent and Hispanics by 19 percent. For further proof of the CPP’s enormous burden, Alford easily could have turned to Obama’s own Energy Information Administration. Its May report titled Analysis of the Impacts of the Clean Power Plan and data on its website echo Alford’s warnings and show, if anything, that he should slam this draconian scheme even harder. * Slash real GDP by $993 billion, or an average of $39.7 billion per year. * Slice real disposable income by $382 billion, or $15.3 billion annually. * Chop manufacturing shipments by $1.13 trillion, or $45.4 billion a year. * Cut light-vehicle sales by 310,000 units, or 12,400 yearly. * Hack non-farm employment by 900,000, or 35,000 per annum. On the bright side, Obama estimates that the CPP will save American households $7 per month on their electricity bills, come 2030. This sounds lovely. However, mandating that emissions be 27 percent below 2005’s 6 billion metric tons of energy-related carbon dioxide would slash such output to 4.4 billion metric tons — an amount last observed in 1983. It seems cruel to demand that the 335 million Americans who the Census forecasts will live here in a decade produce as little carbon dioxide as just 234 million Americans yielded 42 years before 2025. Despite its immense costs, the CPP is expected to deliver paltry ecological “benefits.” By 2050, carbon-dioxide concentrations would drop by less than 1 percent. Satellite data demonstrate that Earth’s average temperatures have been stable since 1998. Even if one embraces Obama’s breathless fantasies about a planet boiling in its own pressure cooker, the CPP does remarkably little about this. The EPA estimates that Obama’s contraption will cut Earth’s expected warming by 0.02 degrees Fahrenheit by 2050. If such a temperature trim costs $382 billion in disposable income, a 1-degree Fahrenheit reduction would require $19.1 trillion — with a T — slightly higher than today’s $18.4 trillion national debt. As the EPA and IRS Have Shown, with Big Government Comes Little Accountability “The value of this rule is not measured in that way,” EPA administrator Gina McCarthy told Representative Lamar Smith (R., Texas) at a July hearing of the House Committee on Science. “It is measured in showing strong domestic action which can actually trigger global action to address what’s a necessary action to protect” the planet. So, as the EPA’s chief admits, Obama has concocted a vastly expensive symbol. It kills jobs and, its authors hope, will inspire foreign governments to handcuff their economies and shackle their people. Among the weapons purchased are guns, body armor, camouflage equipment, unmanned aircraft, amphibious assault ships, radar and night-vision gear and other military-style weaponry and surveillance activities, according to a new report by the watchdog group Open the Books. “Protecting the environment just got real. With millions of dollars spent on military style weaponry, the EPA is now literally ensconced with all institutional force,” said Adam Andrzejewski, founder of Open the Books and the author of the report. “Our report discovered that when the EPA comes knocking they are armed with a thousand lawyers, arrest/criminal data, credit, business and property histories, plus a ‘Special Agent’ with the latest in weaponry and technology,” Mr. Andrzejewski added. 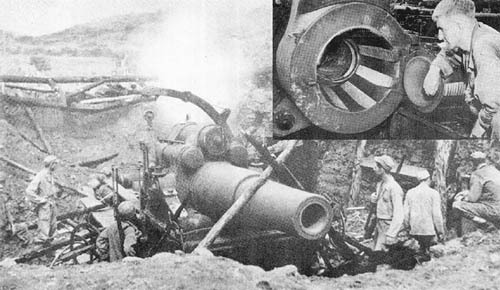 According to the accompanying specifications, the 300 mm Type 7 Short Howitzer captured by U.S. troops from Japanese forces in the Phillippines was capable of firing a 300 mm caliber projectile out to a range of nearly 7.4 miles. Meanwhile, we should note that like the Environmental Protection Agency’s special agents, the FSA rebels have also been funded and trained by the U.S. government. One wonders just how the EPA’s special agents would use that size weapon to enforce the nation’s environmental protection laws. Someone at the EPA really needs to explain why it would ever need that kind of firepower to justify using that particular specification on its gun purchase requisitions. In an important new report published today by the Global Warming Policy Foundation, former IPCC delegate Dr Indur Goklany calls for a reassessment of carbon dioxide, which he says has many benefits for the natural world and for humankind.